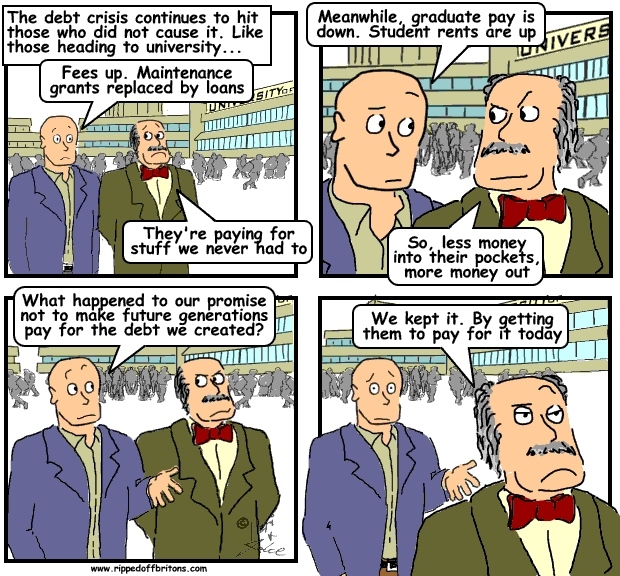 What happened to our promise not to make future generations pay for the debt we created? Between 2010 and 2013, rents rose 25%, according to the student housing charity Unipol. This compared with rises in the wider rental market over the same period of 13%, according to Homelet. The latest Unipol data, to be published in November, is expected to show further rises of around 7%. A maintenance loan of up to £8,000 in London or £5,500 outside the capital is available to students for help with living costs, but the National Union of Students (NUS) is concerned that the sky-high costs of housing mean this is now being almost being completely eaten up by rent. NUS figures for the academic year just gone show a typical £8,000 a year shortfall between student living costs and their income from loans and the maintenance grant. The housing charity Shelter said: “Even when people do find somewhere, we too often hear from students dealing with issues like poor conditions, unprotected deposits and unfair terms in tenancy agreements.” The figures from Shelter’s Private Tenant Survey show that 50% of students are struggling with rent and 40% of student renters had borrowed money from any one of a range of sources to meet their monthly rental payments, in the last year. The majority of the new accommodation needed will be provided by private companies, which in 2013 provided 80% of new bed spaces, according to Unipol. Already this year private investment in student digs has reached record levels with billions poured into the market by Russian, Middle Eastern and Canadian investors. At the same time, the lower-cost rooms available from education institutions have got much more expensive, rising 23% in price since the academic year 2009-10, according to Unipol. This means some institutions no longer have any low-cost rooms for their poorer students. Overall, 58.8% of graduates are in jobs deemed to be non-graduate roles, according to the Chartered Institute of Personnel and Development. It said the number of graduates had now "significantly outstripped" the creation of high-skilled jobs. The CIPD said: "The assumption that we will transition to a more productive, higher-value, higher-skilled economy just by increasing the conveyor belt of graduates is proven to be flawed." The report found the issue was leading to "negative consequences" including employers requesting degrees for traditionally non-graduate roles despite no change to the skills needed for the role. As a result, it found graduates were now replacing non-graduates in roles and taking jobs where the demand for graduate skills was either non-existent or falling. The trend was particularly prominent in construction and manufacturing sectors where apprenticeships have previously been traditional routes into the industry, the report found. The CIPD is calling for a "national debate" over how to generate more high-skilled jobs. It said government and organisations both needed to act to help graduates make better use of their skills, but said the report also highlighted that for young people choosing an apprenticeship instead of university could be a "much better choice".